After discovering she is pregnant Alexia's husband Conall has thrown her out, believing that as a werewolf he cannot father a child and so assumes that she has been unfaithful. Alexia has to return to her much loathed family. The "infant-inconvenience" is creating many problems, most importantly it is putting Alexia off her food, but more dangerously, the vampires are out to assassinate it (and her)! 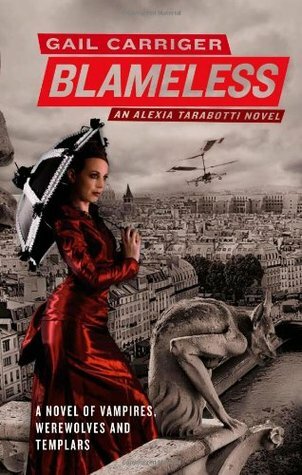 After an attack from mechanical ladybirds, Madame Lefoux and Floote accompany Alexia to Italy, the birthplace of her father to discover more about being soulless. I enjoyed this more than the previous one, but...couldn't believe that Conall would behave the way he did and the ending seemed a bit weak; I'm think Alexia needed a greater outburst of her usual forthrightness. I'm not sure about Madame Lefoux, I still see her more as a plot device, rather than an integral part and I'm really worried that Biffy won't be as appealing, or as beautifully dressed now! Better and still great in parts, but not up to Soulless...still!